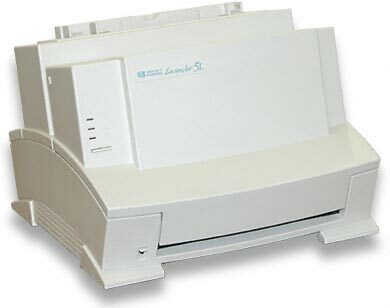 Do you have an old HP LaserJet 5L? Do you use a USB to Parallel port converter for it? I do, and for almost a year, printing on it made me tear my hair out. Print jobs took forever to start, sometimes you’d have to hit a button to get it to print even though there was no paper jam and the biggest nuisance of all was that documents would fail to print correctly. Sometimes you’d get a good top of the page and the bottom would be on the next page. Other times it would print partially, then page after page would spew out with a few random ASCII characters at the top. I was ready to get rid of it and buy something else. Then I looked for an answer online. The solution still stuns me. I replaced the driver for the HP printer with one for an Epson ActionLaser 1500. Yes, that’s correct, the Epson driver makes the HP printer work perfectly, every time. Print jobs start in a second or two, every job has printed correctly and the printer even goes to sleep when it’s idle, coming back to life when necessary. I feel like I have a new printer. If you’re having similar problems, change the print driver to the Epson ActionLaser 1500. There’s nothing to download, it should be available in the list of printers (in XP at least). One tweak to get a little better print quality, though it prints fine without this, is in the printer properties. 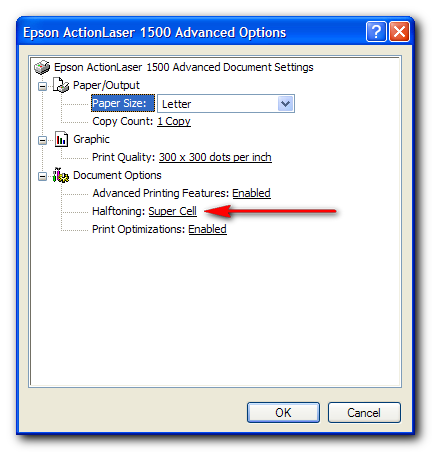 Go to Printing Preferences, Paper / Quality, Advanced… and enable Super Cell for Halftoning. These two links were the most helpful in finding the solution. Update 5 Mar 2011: Drivers for an Epson ActionLaser 1500 are hard to come by on Windows 7, but the HP LaserJet III driver works for the Epson, and seems to do a better job for the LaserJet 5L too. Seriously? We used to have one of these but I might have given it away or taken it to the recycling center, just because it drove me so crazy. Who knew that the solution was so simple? @jeanfor Thanks for the update. I upgraded to Windows 7 and the Laserjet III drivers worked great, but I never updated this post. Thanks a lot brother! HP LaserJet III drivers work like a charm in Windows 7! –	First remove the installed HP LaserJet 5L printer. –	Install a USB / parallel extension to your printer/cable. –	Connect the LaserJet printer with a bidirectional cable. And will install the driver from internet. Then your â€œoldâ€ printer will work under windows 7. GOOD Luck with installation. Ralf. All I can say is Bless You Guys!! I was so dejected that my perfectly wonderful HP 5L suddenly stopped printing properly for who knows what reason. Now I’m back up in business!! I set the HP III as the driver for the 5L and Voila! It now prints the whole page and gets its signals again! Hope HP doesn’t find out and decide to corrupt these other two drivers! @L That’s great, I’m glad you were able to get it working again.